The image above is located in the lower right corner of Windows desktops monitored by ITology. Hovering over this icon will display our Help Desk phone number. Clicking on the icon will bring up a menu to allow you to Create a Service Ticket. To see the iTology icon, it may be necessary to click the up arrow ^ to 'Show hidden icons' to see the full list of icons, as shown on the left. When clicking on the iTology icon, it will display the menu shown to the left. The top three options (Send Status, Screen Capture, and Update Inventory) should only be used if requested by an iTologist while troubleshooting an issue (don't worry, accidentally clicking on one of them won't do any harm). The fourth option 'Create Service Ticket' can be used to submit a service request. Clicking on 'Help' will bring you to this page. When clicking 'Create Service Ticket' from the iTology Icon, the screen to the left will be presented. Please enter an email address where we can send ticket updates in the From: field, then fill in the Subject: and body of the ticket with a brief description of the issue. It may also be beneficial to include a phone number in the ticket body in case we need to reach out with any questions. To attach a screenshot of an error to a ticket, simply press the 'Attach Screenshot' button in the top. 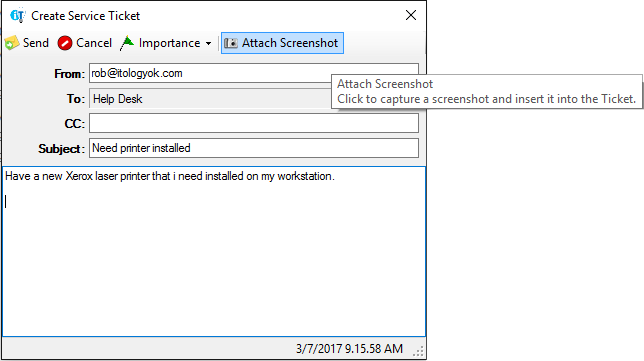 When clicking 'Attach Screenshot', the 'Create Service Ticket' window will disappear so that it can take a screenshot without the 'Create Service Ticket' window being in the way. Click 'Send' in the top left to submit the service ticket to the iTology team!